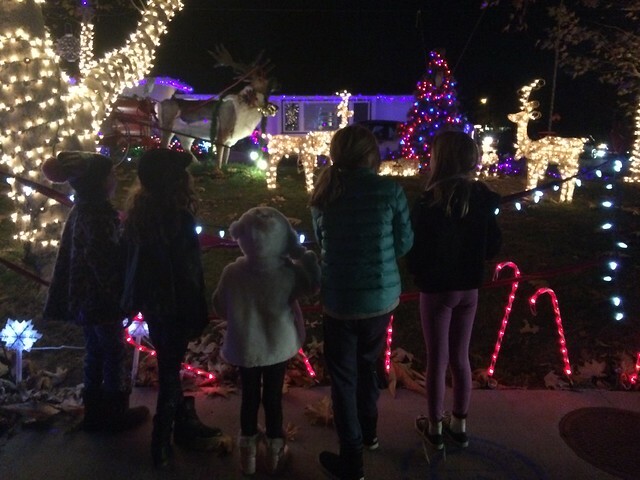 our holiday traditions always include a walk with friends through "Candy Cane Lane". a friend and neighbor recently shared this with me - and for posterity, I felt I need to save it here. The Post Office knows our street as Lubao Avenue. But for one month every year Southern Californians come from as far south as Huntington Beach and as far north as Santa Barbara to view the Christmas spectacle known as Candy Cane Lane. The tradition started in the fall of 1953 in a newly developed neighborhood called Walnut Acres. When I was very little I accompanied my parents to the first potluck get together put together by Helen, the eccentric Lucille Ball look-alike lady across the street. She and her husband had made a carved wooden Santa’s workshop complete with motorized elves with hammer and saws all working in unison to make toys. That Sunday afternoon in 1953, the concept of creating the holiday spectacle for all to enjoy was born. In Helen’s cheery farmhouse kitchen with red and white gingham curtains, ideas began to unfold as the women sipped coffee and the men poured martinis. As it was told, Helen begged the neighborhood boys to lift the magnificent toy land onto her spacious shingle roof. As she was flitting around in her spiked heels and flicking her cigarette in its diamond encrusted holder, they could not refuse their glamorous neighbor! The adults proceeded with what was the first of many history making meetings of the Candy Cane Lane decorating committee. My father Donald Harwood said he recalled seeing a pile of sheet metal pipes that had been discarded in an empty lot nearby. By curving them with a blowtorch, spray painting them white and wrapping red tape around them, the neighborhood men made 30 pairs of 10 foot candy canes. Each house would display the candy canes in the center of their yard. It was established that the Sunday after Thanksgiving would be the day that the holiday decorations would go up and the only stipulation for conformity were the candy canes. The following year the local creative juices flowed. During the summer and fall months the garages of Lubao Avenue buzzed with the sounds of saws and hammers. There was such an incredible air of excitement and secrecy that many of us worked with our garage doors closed. My dad bought a new jigsaw and had cut out a Santa and eight reindeer measuring 6 feet tall. Instead of a sleigh, Santa’s head popped out of the window of dad’s 1941 Cadillac, his hand waived using the motor of a turntable. The reindeer were led by Rudolph, complete with a 60 watt red light bulb attached to his nose. All the reindeer were suspended by wires ascending skyward. The following year more new homes were complete, more new friendships had been formed and more candy canes were commissioned. This time from a sheet metal company and at a bargain of only $3.50 a pair! Our decorating Sunday turned into more than that as the women baked cookies and those one dish meals called casseroles. As the sun set we gathered at Helen’s house to enjoy a potluck supper. My mom Jean made Jello salad and a tuna noodle dish. The others brought meatloaf, scalloped potatoes, green bean casserole and Lazy Daisy Oatmeal Cake. After what seemed like a lifetime we were allowed to go outside and view the spectacular scene that until this moment no one knew what each other had created in those secret garages. As the Christmas custom transpired so did the new development of ranch style homes so typical to the West San Fernando Valley. As I grew older the street changed. The Walnut trees were replaced with liquid ambers and birches. New neighbors moved in and our friends left for various reasons. As property values increased in the late 1970’s many professionals and actors came and went. Mickey Rooney was the first to leave Candy Cane Lane in the mid 1950’s for Beverly Hills. Then, Chuck Connors and “The King of The Road” Roger Miller left in the late 1970’s. Director Leo Penn, his wife and sons, Michael, Sean and Chris moved in a few houses down from us, but only stayed a few years. During my high school years, my parent’s front yard was the scene of many boisterous caroling parties, joined sometimes by the Taft High Marching Band. These events were always followed by a warm invitation into our Kitchen for Mom’s snowball cookies and hot chocolate. Some years were better than others. The famous street was forced into darkness for one Christmas due to the energy crisis in the late 1970’s. The police had to patrol the area more than once to catch the kids that were stealing light bulbs and other decorations. Illness and old age were dismal reasons for sporadic dark spots in our magical neighborhood. Our next door neighbor Vaughn was sick one year and could not participate, so he just put up a sign that said Scrooge with a flood light on it. We appreciated his humor, but a lot of people did not and egged his sign! When my kids were young we had to get to Granma and Grandpa’s house before dark to avoid the traffic. The 101 Freeway was backed up for miles in both directions. We often would spend the night because the cars would keep coming well until midnight. The streets running parallel with Lubao also started their own traditions. Penfield was Caroler’s Way, decorated with cut outs of Christmas Caroler’s and music sounded from hidden speakers. Two Blocks over was Jumilla and it was called Avenue of the Bells. There were little churches and synagogues displayed with a giant bell hanging over them. The last street was Oakdale and they were called Candle Light Lane. The 6 foot candles were constructed of old tires spray painted silver with a stovepipe inserted in the middle and light bulbs. Eventually, there were more changes and bigger and bigger displays. Cartoon figures became popular and so did more mechanics. Helen and Vaughn are long gone, so is my dad and my mom. Now in the 2010’s it is still possible to capture some of that holiday magic made possible by the pioneers of Lubao Avenue. Although is it not the same for me now more than 50 years later it is wonderful to see the tradition carry on with the children and grandchildren of those pioneers. Thanks to Donna Harwood for reminiscences about Candy Cane Lane. I grew up on Penfield at the same time and remember the Harwoods very well- really nice people. All the decorations spiced up the holidays tremendously. It was great time and place to be a kid.